Of course, there is no doubt that we chat every day. But the stress in chatting needs to be reduced so as to attract many. Actually, most people prefer to call than to text, because of the stress that is attached to chatting. But as the world advances, there are new techniques that are devised to eliminate the stress in chatting; and one of it is abbreviating words to chat. When words are abbreviated, it makes it easier and faster for people to chat (text). Well, this particular technique had already been in existence. 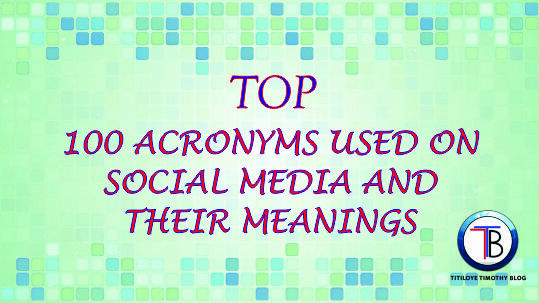 But it is so painful that most people don't know the meaning of most of these acronyms/abbreviation used. 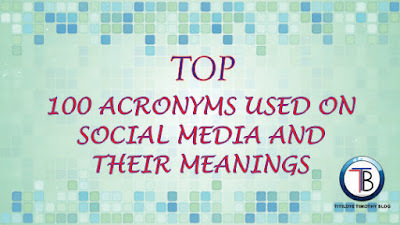 In this post, I will be listing 100 acronyms that are commonly used on the internet (social media most especially) with their rightful interpretations. Though, there are hundreds of acronyms used on the web. But I will be limiting this write-up on just 100. 15. WDYW – WHAT DO YOU WANT? 26. YGM – YOU GET ME? 31. WTM – WHAT'S THE MATTER? 50. HAY – HOW ARE YOU? 51. WWYD – WHAT WILL YOU DO? Feel free to add yours using the comment box below. Also, you can ask your questions on some acronyms you don't understand that is been used on social media. We are here for you!!! this is interesting. I have got to know what i did not know. These acronyms destroy your English. I prefer writing the words complete so I can be understood. There is one they use which is LMAO and LOL. I don't get those ones. What is their meaning?